Belgian students stopped attempts to shut down Israeli Apartheid Week events at their universities, holding a wide range of events and actions that frequently focused on the struggles of Palestinian political prisoners between 6 and 11 March. Zionist organizations had attempted to block the participation of Palestinian-French former political prisoner and researcher Salah Hamouri, directing complaints at university administrations and demanding his voice be silenced. Despite these attempts, all IAW events in Belgium went forward as planned despite attempted disruptions. Israeli Apartheid Week 2017 in Belgium focused strongly on the struggle of Palestinian political prisoners, in part because of LAW-TRAIN, an EU-funded research collaboration that brings together Belgian judicial police and prosecutors and KU Leuven with the Israeli National Police, Ministry of Public Security, Bar-Ilan University and Spanish police and prosecutors to study interrogation techniques. A growing campaign across Belgium has included protests in multiple cities, including at KU Leuven’s academic convocation, as well as a delegation by prominent human rights lawyers and scholars to Palestine to look at the impact of Israeli interrogations on Palestinians. Israeli interrogations are infamous for their use of torture, abuse and ill-treatment against imprisoned Palestinians, including Palestinian children. Samidoun Palestinian Prisoner Solidarity Network participated actively in the week of events across Belgium. Charlotte Kates, international coordinator of Samidoun, spoke alongside Salah Hamouri at the University of Antwerp on Tuesday, 7 March, at KU Leuven on Wednesday, 8 March and at Universite Libre de Bruxelles (ULB) on Thursday, 9 March. At all of these events, she spoke about the LAW-TRAIN program and its implications for complicity in torture, racism and apartheid. Hamouri provided a thorough overview of the current and historical situation of Palestinian prisoners in Israeli jails, emphasizing the experience of arrest, interrogation and imprisonment. He discussed the large-scale use of administrative detention, imprisonment without charge or trial as well as the Israeli military courts that convict over 99 percent of the Palestinians brought before them. He provided a political analysis of the situation of Palestinian prisoners, as well as discussing his own experience behind Israeli bars. Other events during Israeli Apartheid Week in Belgium also focused on the struggle of political prisoners, including several screenings of the film “3000 Nights,” a feature film by Mai Masri about the life of an imprisoned Palestinian woman, and a Palestinian evening at UCL-Alma which included a Skype conversation with Mariam Barghouthi, a formerly-imprisoned Palestinian youth activist. Salah Hamouri spoke alongside Alexis DeSwaef, the director of the League for Human Rights in Belgium and a participant in the human rights delegation to Palestine that studied LAW-TRAIN in an evening event in Louvain-La-Neuve on 8 March. The focus on Palestinian prisoners during Israeli Apartheid Week was not restricted to Belgium. 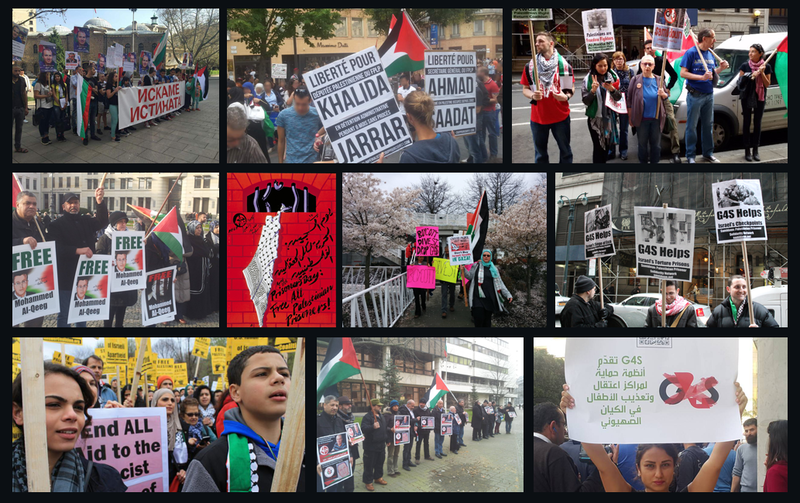 Across the border in Maastricht, the Netherlands, Students for Justice in Palestine – Maastricht hosted Samidoun’s Kates on 8 March for a presentation on Palestinian political prisoners, anti-BDS repression and EU complicity. Kates provided an overview of the situation of Palestinian political prisoners today, including key statistics, as well as situating their struggle in the context of the Palestinian movement against colonialism and attempts to suppress it. She emphasized the importance of raising the level of activity in solidarity with Palestine in response to attempts to suppress BDS activism and organizing, particularly noting the role of the right wing in allying with Zionism and attacking Palestinians and Arabs, not only in Palestine but also in Europe, and emphasizing the role of the Palestinian movement as part and parcel of struggles against racism, fascism and oppression. She also discussed the growing international campaign to boycott Hewlett-Packard (HP) products, noting the company’s involvement in Israeli checkpoints, prisons, settlements and the Apartheid Wall and dismissing claims that HP technology “improves” checkpoints for Palestinians, as such technology is in fact perpetuating occupation and colonization. Israeli Apartheid Week events in Belgium were organized during the week at the ULB (Universite Libre de Bruxelles), KU Leuven, University of Antwerp, Universite catholique de Louvain (UCL) Alma, University of Ghent, and UCL in Louvain-la-Neuve, as well as a closing cultural event at Le Space. Additional events are planned in the coming days at the University of Ghent, KU Leuven, Saint-Louis University, and the Vrije Universiteit Brussel (VUB), including a mobilization on 16 March at KU Leuven protesting the university’s involvement in LAW-TRAIN.